Saving in training costs. By no longer requiring support staff to log onto Cisco UC servers, there is no longer any requirement for an organisation to have its support staff Cisco UC trained. Savings in troubleshooting time. Creating all configuration objects (such as CUCM user, phone, device profile, voice mail, RDP) on several Cisco servers has become a complex process which requires a lot of training and understanding of Cisco specific technology. This process is challenging for experts and has become impossible for less skilled users, especially in large enterprises. The more servers that need to be accessed increases the chance of a phone administrator to make a mistake. These types of mistakes are costly as it may require all servers touched during the provisioning job to be revisited. As the Provisioning System is an automated and rule based process which validates entered data and operations, mistakes are eliminated and even complex actions are performed correctly, first time, every time. Saving in integration costs. The system can be easily integrated into an existing Enterprise Configuration Management (ECM) to include provisioning of end users into their Cisco Telephony system via the Provisioning System API. Savings in standardization of configurations. Economy of scale benefits can only be achieved with a standardized process and standardized setup procedures. The Uplinx Provisioning System ensures that all users and devices are configured to an organisation's standards. This is enforced through the core configuration/job templates which are created based on sites. These templates only need to be configured once and are used to enforce standards. This then leads to savings in maintenance, troubleshooting and user support. Yes. Uplinx Auto Provisioning for Cisco minimizes provisioning effort and provides fault free provisioning based on rules and templates. Provisioning can be run fully automated based on rules, or if supervision is desired, a site administrator may approve and update commissioning jobs created by the system. Alternatively, the Uplinx Console allows performing complex and non-standard operations at hoc for a site administrator or help desk operator. Only a trained phone administrator or service desk operator may understand the telephony requirements of a new phone user and will select the correct telephony class for a user when no rule or information in Active Directory is present. Human intervention is required when varying models of IP handsets may be required for different users. Auto provisioning may not fit into any enterprise due to the disparate and complex nature of todays business processes and systems. Merging current business processes into one may not be an option or requires to many organizational changes. For example, Auto Provisioning integration into a HR system requires that the HR system contains decision elements such as telphony classes (is the user a standard user, call center user, assistant or manager?). The person entering the HR record would need to make the decision on behalf of a telephony administrator. 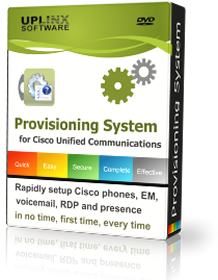 The Uplinx Provisioning System for CIsco and Microsoft Exchange and Lync is an "off the shelf" solution which can be configured through its job templates to cater for the majority of organisations telephony support requirements. It offers various integration options such as the Console for operator based provisioning and/or rule based semi-automated provisioning. Can we have a presentation and demo? Certainly, please contact us with details about your requirements and telephony setup. The Provisioning system is licenced based on the number of clusters and phones it is required to support. The first years maintenance is included in the purchase price. Maintenance is then charged on an annual basis on the anniversary of the purchase of the initial licences. 8x5xNBD software support is provided for the provisioning system software.